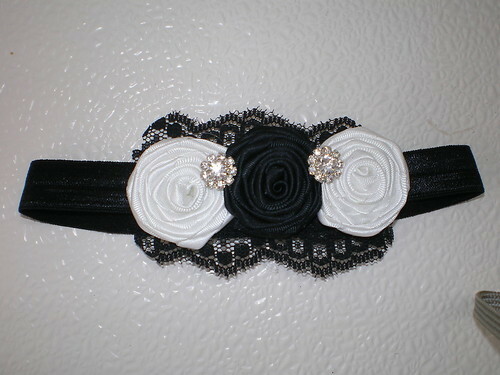 For sale is a sweet headband for baby girls, toddlers or even older. It has three handmade rolled satin roses. It is Perfect for Baby Photos. Measurement: Relaxed - 13 inches and will stretch to about 16 1/2 inches. If you need a larger size, please message me. This would make a perfect photography prop for newborn infants baby photos, weddings or special occasions such as the Easter Dress. All of my items are made in my clean, smoke-free home. 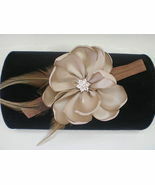 ***** FEEDBACK ***** *** I WILL LEAVE YOU FEEDBACK AFTER YOU HAVE LEFT MY FEEDBACK AND I KNOW YOU ARE HAPPY WITH YOUR ITEM. *** VERY IMPORTANT MESSAGE: ***AFTER YOU RECEIVE YOUR ORDER, PLEASE CONTACT ME IF YOU ARE UNABLE TO LEAVE 100% POSITIVE FEEDBACK. I WOULD LIKE TO KNOW IF YOU ARE NOT COMPLETELY SATISFIED, THANKS ***** SHIPPING ***** I NOW OFFER FREE DOMESTIC SHIPPING. I STILL COMBINE SHIPPING FOR MY INTERNATIONAL BUYERS, WHEN I CAN. INTERNATIONAL SHIPPING WILL HAVE TO BE CALCULATED. INTERNATIONAL BUYERS – PLEASE NOTE: YOUR ITEM WILL BE SHIPPED WITHIN FIVE (5) DAYS AFTER PAYMENT IS RECEIVED. !!!!! PLEASE !!!!! DO NOT PENALIZE ME WITH LESS THAN 100% POSITIVE FEEDBACK BECAUSE IT TOOK LONGER TO REACH YOUR INTERNATIONAL LOCATION. IMPORT DUTIES, TAXES, AND CHARGES ARE NOT INCLUDED IN THE ITEM PRICE OR SHIPPING COST. THESE CHARGES ARE THE BUYER'S RESPONSIBILITY. PLEASE CHECK WITH YOUR COUNTRY'S CUSTOMS OFFICE TO DETERMINE WHAT THESE ADDITIONAL COSTS WILL BE PRIOR TO BIDDING OR BUYING. CUSTOMS FEES ARE NORMALLY CHARGED BY THE SHIPPING COMPANY OR COLLECTED WHEN YOU PICK THE ITEM UP. THESE FEES ARE NOT ADDITIONAL SHIPPING CHARGES. I WON'T UNDER-VALUE MERCHANDISE OR MARK THE ITEM AS A GIFT ON CUSTOMS FORMS. DOING THAT IS AGAINST U.S. AND INTERNATIONAL LAWS. THANK YOU FOR VISITING MIMI'S PRECIOUS DESIGNS.